Zone 1 (Primary Significance): Buildings, spaces and site elements in Zone 1 are part of the core historic camp and are integral to Frank Lloyd Wright’s design and development of the site. In addition, these buildings and site features contain much of their material from the period of Frank Lloyd Wright as well as a high level of integrity. Zone 2 (Secondary Significance): Buildings, spaces and site elements in Zone 2 are either non-public spaces that are not integral to the significance of Taliesin West but still maintain some material from the period of Frank Lloyd Wright, such as the shops and the interiors of the apprentice apartments; or they are buildings within the historic core of the campus that were essentially reconstructed and modified after Frank Lloyd Wrights’ death in 1959. Zone 3 (Tertiary Significance): Spaces and buildings in Zone 3 are those that were largely reconstructed after the period of Frank Lloyd Wright (1938 – 1959), but still contain some original elements of Frank Lloyd Wright’s earlier buildings at these locations, such as the desert masonry. These buildings still contribute to the history of Taliesin West because of their association with Frank Lloyd Wright, Olgivanna Lloyd Wright and the Taliesin Fellowship. Zone 4 (Minor Significance): Spaces and buildings in Zone 4 were constructed after the period of Frank Lloyd Wright (1938 – 1959) and are not the work of Frank Lloyd Wright. These buildings still contribute to the more recent history of Taliesin West due to their relation to Olgivanna Lloyd Wright and the Taliesin Fellowship. 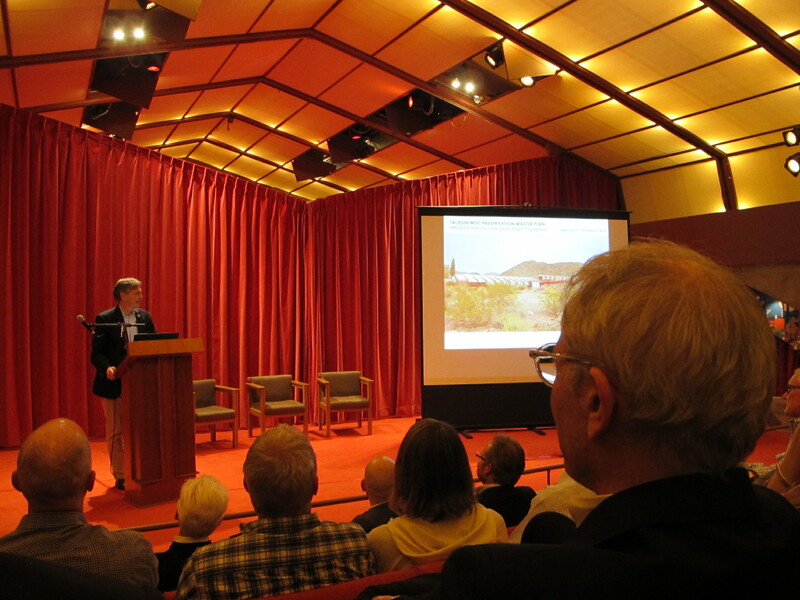 These zones will help the Foundation prioritize preservation work as well as identify the appropriate treatment for the various buildings at Taliesin West. Preservation Treatment of the Rosen House at Caramoor. Increasingly I’m finding that the zoning of historic sites is a very useful way to evaluate an historic site and to guide decisions about use, preservation, and interpretation. I first encountered a type of zoning in 2003 at Drayton Hall when Michael Van Valkenburgh developed a landscape master plan that categorized architecture,vegetation, and circulation by time period for a 16-acre portion of the site. It prompted me to consider how the Secretary of the Interior’s Treatment of Historic Properties with its four approaches (preservation, rehabilitation, restoration, and reconstruction) could be selectively applied to historic house museums, who are often caught in dilemmas between preservation and use. My first opportunity to apply this idea was at Caramoor in New York last year. They were seeking ways to care for and interpret the historic Rosen House, which is actively used for concerts, tours, and events. After reviewing current uses, historical significance, and architectural integrity, and in consultation with staff, I created a zoning system to guide the preservation and activities in various spaces. They’ve been very pleased with the result and manner in which preservation and use are balanced. 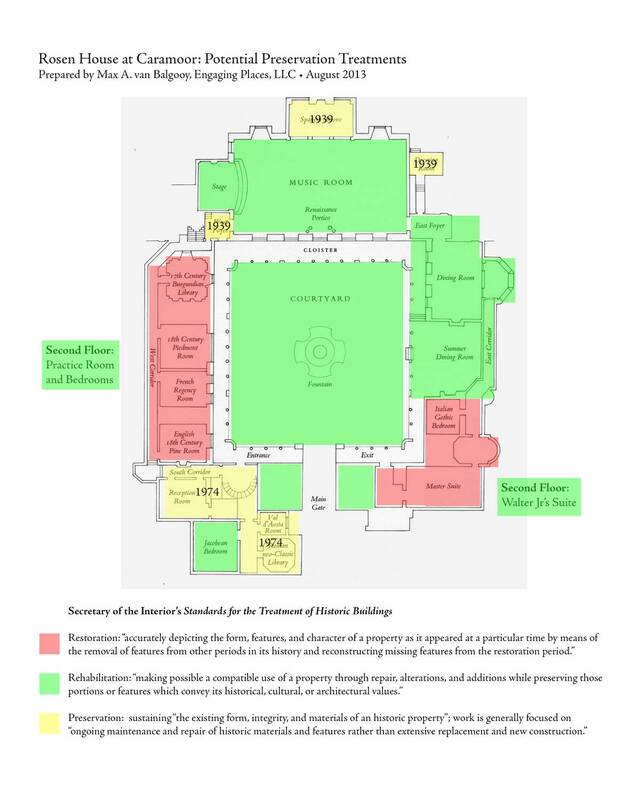 If anyone else has developed a similar zoned system for their historic site, please share it in the comments below so can develop some standards and best practices for the field. JMA does this as a matter of course when addressing any historic landscape that is open to public access. We organize the landscape using a variety of methods, including “landscape character areas” (see NPS’ A Guide to Cultural Landscape Reports), landscape zones, areas of integrity (based on the level of disturbance to features from the period of significance), maintenance or management zones, etc., whichever is most relevant to the site and to the clients’ goals.